It’s time to invest in your sleep. From going to bed earlier to creating the ultimate cozy bed, there are plenty of ways to maximize the minutes while your body is at rest. One of the most important factors for your quality of sleep is your mattress. Good news! American Freight Furniture and Mattress is the perfect place to pick up a quality mattress at a great price. The Legend Pillow Top Collection is among our most popular selections. This mattress is available in Twin, Full, Queen, and King. Do you ever wonder what’s inside your mattress? There’s no guessing game when it comes to the Legend Pillow Top Collection. This mattress features a Safe Slumber Fire Retardant System to protect against possible fire and smoke damage. 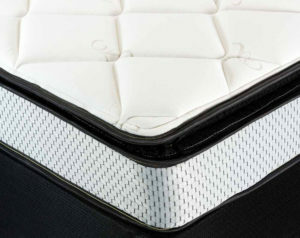 There are multiple layers of Firm Quilt Foam plus a thick layer of Infinilux Dacron. Layered in the heart of this durable mattress is the Softloft Comfort Foam and Extra Firm Comfort Pad. Did we mention there are TWO Extra Firm Comfort Pads? There are! They surround a 2-inch thick Firm Comfort Pad for optimal support. 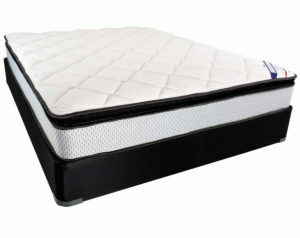 Duraspring Coils and Gauge Coils maximize the comfort of this mattress. Best of all, every Legend Pillow Top mattress is made in America and comes with a 5-year manufacturer warranty. Visit your local store for more details. You need a mattress that will support your neck, back, and the rest of your body night after night for years to come. 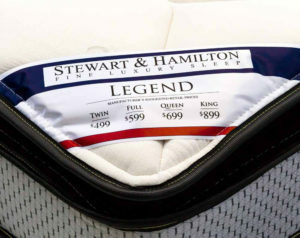 You can depend on the Legend Pillow Top Collection. Not only does this mattress come in every size you need, but also each layer has a specific purpose with comfort and support in mind. Don’t let another night pass by! If your mattress is old, worn, or lumpy, your body can be paying the price. Increase your energy and support a better posture with help from the Legend Pillow Top. Stop by your local American Freight Furniture and Mattress to take your new mattress home today for $50. Click here for more details. Step 1: Find your local American Freight Furniture and Mattress and stop in today. Step 2: Try the Legend Pillow Top mattress before you buy it! Step 3: Sign up for a payment plan and take it home today for $50. Step 4: Transport your mattress or sign up for same-day delivery for all in-stock items. Step 5: Enjoy your brand-new mattress! To get the best experience out of your new bed, we recommend buying a new bed frame, sheets, pillows, and comforter to go along with it! Read more about how to create the ultimate cozy bed here. Click here to go to our store locator page and find the American Freight Furniture and Mattress in your neck of the woods. We carry a wide variety of quality furniture at a deep discount. Browse our furniture and mattress selection and try before you buy! Did you like what you read today? There’s more where that came from. Become a blog subscriber today to get our latest posts sent directly to your inbox for FREE! All you need is your name and email to sign up. Click here or the image below to subscribe to The Official Blog of American Freight Furniture and Mattress.